Members of the Lower Chamber of Parliament passed a law that punishes the crime of genocide ideology and related crimes. Members of the Lower Chamber of Parliament on Wednesday passed a law that punishes the crime of genocide ideology and related crimes, essentially keeping measures against genocide and its related crimes in the country's legal system. Genocide ideology was already a crime under Rwandan laws and penalties against it were provided in the country's Penal Code. But the latter was recently reviewed, which led to the penalties against genocide ideology being removed from the code and put in a special law against genocide ideology and its related crimes. The special law passed yesterday was analysed by members of the Parliamentary Standing Committee on Unity, Human Rights and fight against Genocide. Its chairperson, François Byabarumwanzi, explained that the law will not only punish those who deny genocide that was perpetrated in Rwanda and abroad but also those who will try to sensitize other people to commit any other genocide. 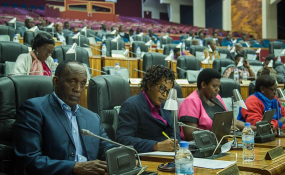 "Everything that is stipulated in this law clearly sanctions any forms of sensitisation to commit genocide or deny it," he told other Members of Parliament (MPs) in a presentation. The law has described the crime of genocide ideology and related crimes as well as how they are penalised. It stipulates punishments for crimes that include genocide ideology, denial of genocide, minimization of genocide, and justification of genocide, which attract a term of imprisonment of not less than two years but not exceeding four years, with a fine of not less than Rwf500,000 but not exceeding Rwf1,000,000 for each count. Causing disappearance or degradation of evidence of genocide is also a crime under this law and it attracts a term of imprisonment of not less than five years but not exceeding seven years, with a fine of not less than Rwf500,000 but which does not exceed Rwf1,000,000. Stealing or destroying the bodies of victims of genocide and demolishing, damaging, or desecrating a memorial site or a place where the bodies of genocide victims are laid to rest are also crimes under this law and they attract tougher penalties. Convicts of each of these counts are liable to a term of imprisonment of not less than ten years but not exceeding fifteen years, with a fine of not less than Rwf1,000,000 but not exceeding Rwf2,000,000. Another crime that has been stipulated in the law is violence against a survivor of genocide, which attracts a term of imprisonment of not less than five years but which does not exceed nine years, with a fine of not less than Rwf500,000 but not exceeding Rwf1,000,000. The above crimes described in the law are punished by the penalties of monetary fines provided for them if they are committed by non-governmental organisations, private companies, or political parties but courts may decide to dissolve the organisations or prohibit their operations in Rwanda on top of the fines. While considering genocide ideology and its related crimes, the law will be applied to the case of genocide committed against the Tutsi in Rwanda in 1994, any genocide recognised by the United Nations or international courts, as well as any other act leading to the genocide as defined by international instruments ratified by Rwanda. After yesterday's final approval by the Lower House of Parliament, the law now awaits presidential assent before it can be published in the Official Gazette and start being implemented.